Enabling you to become a registered adult nurse to care for adults of all ages with acute/long-term illness, in a multitude of healthcare settings. You will distinguish yourself with a degree from one of the first institutions to offer the new Nursing and Midwifery Council (NMC) standards for nursing education and you’ll practice your clinical and communication skills both in the clinical environment and the safe, supervised setting of our Clinical Skills Resource Centre (CSRC). You will have the option to study at Plymouth, our Knowledge Spa Campus, Truro or at our new School of Nursing in Exeter. Apprentices do not pay any course fees. By studying a degree apprenticeship, students will obtain a full honours degree registrable with the NMC and not incur any costs. Fees are paid for by the employer. co–funded: Non levy organisations and Levy who have exceeded their Levy contribution. Estimated course cost £27,000 for three year route and £18,000 for shortened programme – final fees pending. If you are a non-levy paying organisation (the annual pay bill of your organisation is less than £3 million) or you are a Levy organisation who has exceeded their pot, the government will financially co-support your apprenticeship training – they will contribute 90% of the costs and the employer will contribute 10%. GCSE's: GCSE grade C/4 (or equivalent) in mathematics and English. Functional skills level 2 mathematics and English will be considered as an alternative. Foundation degree: Completed a relevant FdSc programme leading to Assistant Practitioner/Nursing Associate status (or equivalent) with an overall grade of 60 per cent or higher. Experience: 800 – 1150 hours in a relevant clinical practice. Evidence of learning within the last five years. GCSE's: 5 GCSEs (or equivalent) including mathematics, English and Science at grade C/4 or above. Functional skills Level 2 mathematics may be considered. UCAS tariff: 104 - 120 UCAS points from a minimum of two A levels (excluding General Studies). Access Course: Passed a named Access to Higher Education Diploma with at least 45 credits at Level 3, 33 at merit/distinction which must include 15 Level 3 credits in Science/Social Science/Psychology/Sociology. International Baccalaureate: 28 points overall to include a minimum of two higher level at 4 (preferably from Biology/Human Biology/Applied Science). If overseas and have not studied English within IB - Must have IELTS: 7.0 overall with 7.0 in all elements. You must pass disclosure and barring service and occupational health checks satisfactorily in order to be able to start this course. If English is not your first language and you do not have GCSE English grade C or above you will have to achieve an IELTS or equivalent qualification at the grades stated below. IELTS - Overall average score of at least 7.0, with a score of at least 7.0 in each element. Please note: Equivalent qualifications may be considered, please contact admissions@plymouth.ac.uk to enquire. At the University of Plymouth we understand some of the challenges employers have in developing and retaining highly skilled employees and we are excited to be offering the Registered Nurse (Adult Health, Child health, Mental Health) Degree Apprenticeship, which has been designed to offer a flexible degree level work based learning programme which meets the standards set by the NMC and which It aligns with Health Care Employers strategic objectives and goals around workforce planning. Typically, the programme is offered over three years, however experienced health care practitioners with relevant experience and qualifications (800 – 1150 hours clinical experience, mathematics and English minimal level 2 functional skills and relevant FdSc programme leading to Assistant Practitioner/Nursing Associate status or equivalent with an overall grade of 60% or higher) can complete the programme within 18 months to two years. This programme meets the standards set by the NMC, we are in the process of re-approval based on the 2019 NMC standards, as part of re-approval we are offering a full time and part time flexible programme. Your apprentice will have ongoing support of an academic tutor for the duration of the programme as well as receiving guidance and support from their mentors during clinical placement. Your organisation will be supported by a named nurse academic and our apprenticeship manager who is responsible for the contractual and tripartite arrangements with the employing organisation. They will be able to guide you through the contractual process and will arrange to meet with the apprentice and a representative from your organisation on a 12 weekly basis. As per NMC requirements the apprentice will be supernumerary for the duration of the programme and will be required to have clinical placements in a variety of settings. If the annual pay bill of your organisation exceeds £3 million you will pay for your apprenticeship training through your levy account and is fully funded by you as the employer. Once you have exceeded the spend on your Levy account you will then move to the co-funded model where you will pay 10% of the cost and the government will co-fund this by 90%. If you are a non-levy paying organisation the government will financial co-fund your apprenticeship training by contributing 90% of the costs and you will support this with the remaining 10%. Employers with fewer than 50 employees will have 100% of the training and assessment costs covered when training a 16-18 year old (or 19-24 year old formerly in care or has Local Authority Education, Health and Care plan. The government will pay £1,000 to employers, and a further £1,000 to training providers if they train a 19-24 year old leaving care or who have a Local Authority Education, Health and Care plan. By studying a degree apprenticeship, students will obtain a full honours degree, at no cost to the individual. Fees are paid by the employer and supported by government funding (up to 90% of the cost). If the annual pay bill of your organisation exceeds £3 million you will pay for your apprenticeship training through your levy account. If you have exceeded your levy contribution you will fund apprenticeship training through the co-funded model – to better understand how this will work please make contact with us. Employer contribution £27,000, pending confirmation of 2019 fees. For further information contact Enterprise Solutions at the University of Plymouth on enterprisesolutions@plymouth.ac.uk or +44 800 052 5600, to be put in touch with the relevant Degree Apprenticeship Account Manager. Your first year introduces you to being an accountable professional, whilst developing the knowledge and skills required to become a confident, academic and independent learner. You will gain an understanding of human development, key body systems and their relationship to nursing care. A range of effective therapeutic interpersonal skills to promote engagement and helpful collaborative person-centered conversations will be nurtured within the theory and the two practice components during the year. You will be introduced to the importance of assessing, planning, providing and evaluating health and wellbeing in a broad range of contexts. You will learn and develop the values, knowledge and skills required for the successful achievement of the standards of proficiency required for the first NMC progression point. Modules will have field-specific application. In your second year you will be introduced to research methodology and methods in order to develop their knowledge of the application of research-based evidence to professional practice. You will study the pathophysiological processes involved in commonly encountered health conditions to support nursing interventions. Your knowledge and understanding of co-ordinating care for complex health needs will be developed, as well as in relation to public health, policies and legislation. You will become a knowledgeable practitioner with an understanding of pharmacology and safe practice in the management of medicines. The theory and two practice components of the year will develop your values, knowledge, and skills required for the successful achievement of the standards of proficiency required for the second NMC progression point. Modules will have field-specific application. Year three allows you to critically explore the concepts of management, leadership and working in teams. You will extend your knowledge around critical appraisal and the importance of research evidence to professional practice. Within four field specific modules you will develop your knowledge and understanding of nursing in the primary and acute care context. 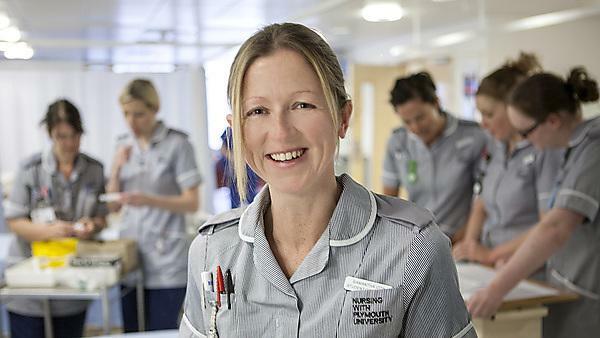 You will develop your competence in nursing practice in simulated and real-world environments and build on and develop the values, knowledge and skills required for the successful achievement of the final NMC progression point. Your final module will provide you with the opportunity to demonstrate your ability to perform as a capable and autonomous practitioner, fit for registration in your field of nursing practice. You must be dedicated! Every day I meet such wonderful patients who deserve the very best, high quality care which I believe can only be provided by people who are committed to their work… if it’s something you really are interested in, then go for it! For those who are not eligible for nursing through the degree apprenticeships route, please view our student funded course - BSc (Hons) Nursing (Adult Health).